On Tuesday 5 May the independent Russian newspaper Novaya Gazeta published a hitherto unknown report about the downing of flight MH17. It was reportedly drafted by (anonymous) engineers working in Russia’s military-industrial complex. Novaya Gazeta itself did not draw conclusions from the report, other than the headline ‘It was a Buk M1’, and by writing that the report raised ‘new questions’. That it certainly does. The official line in the Russian Federation is that flight MH17 was downed by an Ukrainian Su-25 ground attack fighter plane. But the new report rejects that conclusion. Its authors have studied pictures of the wreckage, their distribution over a relatively wide area, and for example the picture of shrapnel published earlier this year by Dutch RTL correspondent Jeroen Akkermans. 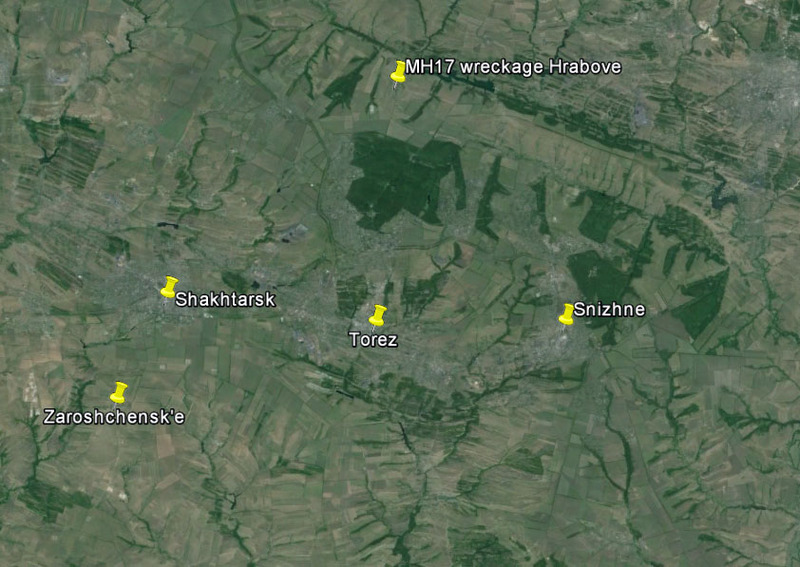 The conclusion of the new inquiry: flight MH17 was downed by a Buk M1 surface-to-air missile. The engineers also calculated the probable location from which the missile was fired (based on the heading, altitude, and speed of the Boeing 777 at the time of the incident). Their second conclusion: the Buk missile was launched fron an an area of 2.5 by 3.5 kilometers south of Zaroshchenkoye (Ukrainian spelling Zaroshchens’ke, itself just south of Shakhtarsk). In conclusion: the new report states the flight MH17 was shot down by a Buk surface-to-air missile, which the Ministry of Defence says was an Ukrainian one. But was it? 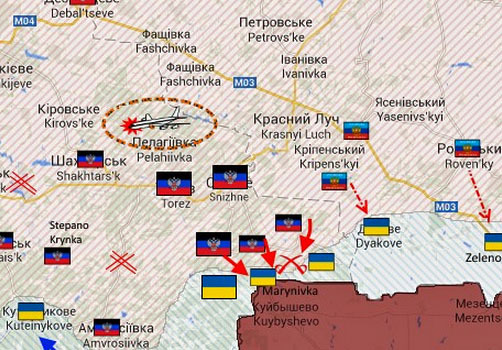 Last July, the area around Zaroshchenskoye was firmly in the hands of forces of the self-proclaimed ‘Donetsk People’s Republic’ (DNR). Maps published at the time by a pro-Russian source (1.) and the National Security and Defence Council (2.) demonstrate this. (FYI: Zaroshchenskoye is located seven kilometers south of Shakhtarsk). 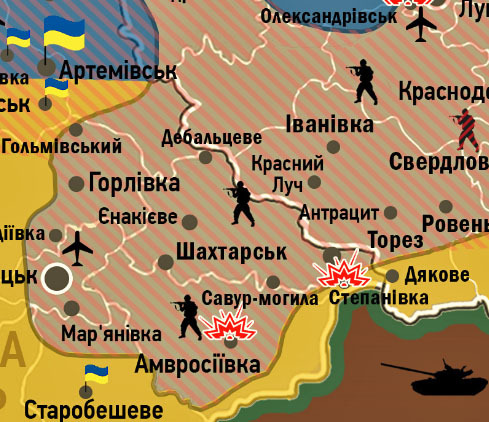 These maps prove without a doubt that the area around Shakhtarsk / Zaroshchenskoye was in the hands of the ‘DNR’. The conclusion of the new report from Russia must therefore be that flight MH17 was downed by a Buk missile launched from a pro-Russian area by military personnel of the DNR or by military personnel from Russia proper. Dit bericht werd geplaatst in Flight MH17, Russian Federation en getagged met BUK, DNR, MH17, Russia. Maak dit favoriet permalink.